We hope you’re not sick of rendering, because there’s a lot more of it on this page. On the previous page, many big-name renderers were tackled, but on this one, others are being gazed at, along with some synthetic tests that will allow you to test your own PC against ours. Intel rules the Dimension CC roost. 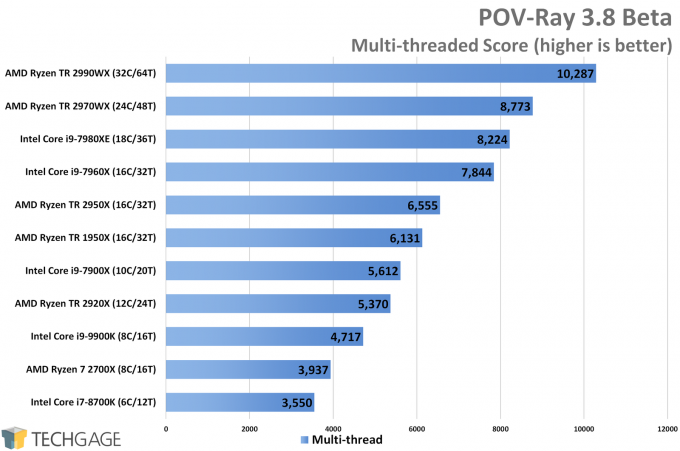 Despite AMD’s core advantage, Intel’s top two chips of the 7th-gen Core X-series lead the pack. At launch, the 2990WX had to be tested without SMT, but the 24-core chip made through fine in this test, due to what could be a variety of reasons. However, there are still some Dimension projects we have that will not open on the top Threadrippers well. We’re hoping to secure better projects for the next full round of testing. 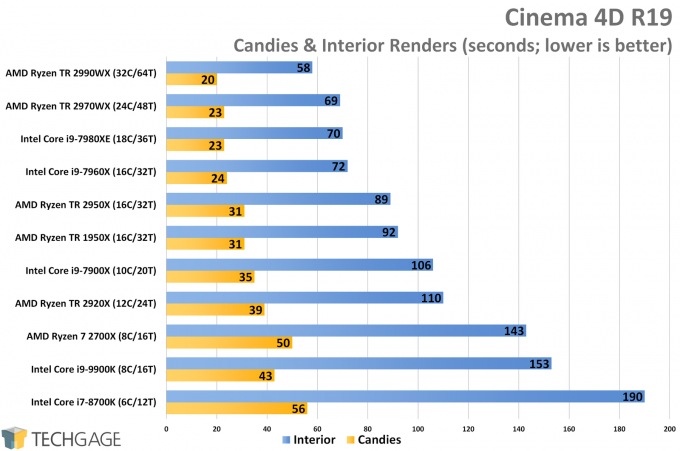 Cinebench is a go-to benchmark for both AMD and Intel, and for the most part, it’s for good reason. 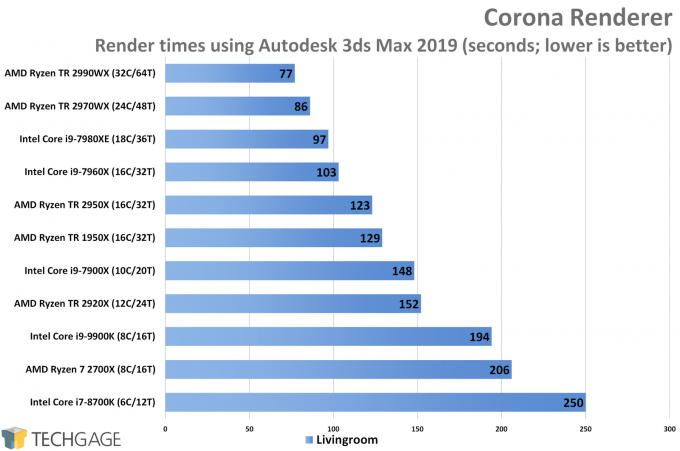 It’s easy to feel like Cinebench is used by these companies only because it scales so well, but the fact of the matter is, Cinebench isn’t only a benchmark; it’s a benchmark for Maxon’s Cinema 4D design suite. 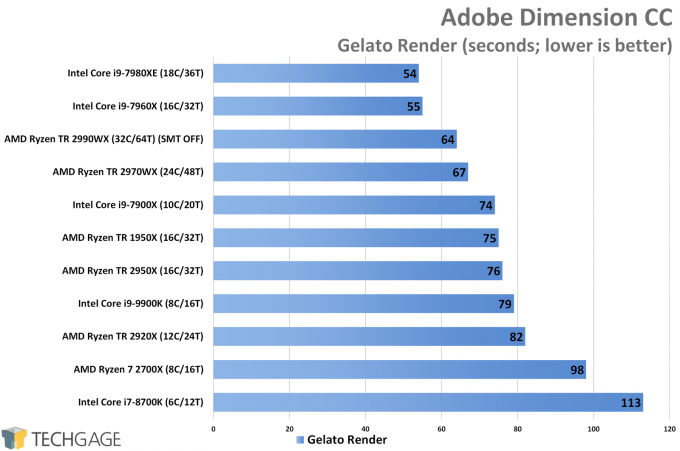 For anyone who uses C4D, Cinebench performance scaling is directly relevant to them. AMD’s 2990WX, out-of-the-box, surpasses the 5K mark, while the 24-core sibling sits under that – but still well ahead of the third-place i9-7980XE. 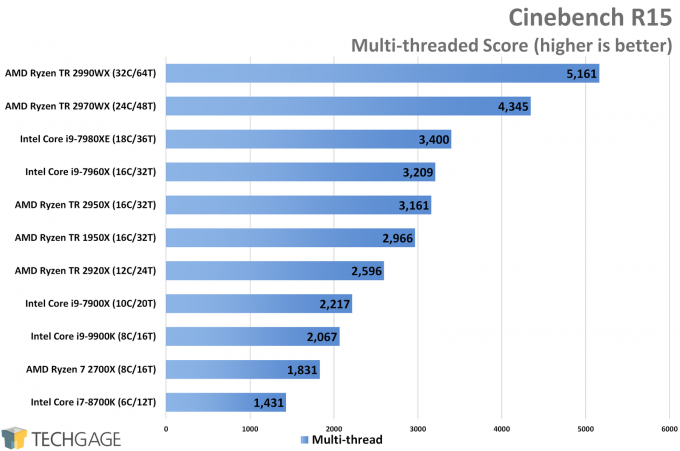 The 2920X again performs quite a bit better than the 10-core Intel i9-7900X – but would the real Cinebench agree with such a statement? Here, the 2920X performs close to the 7900X, while the 2990WX again graces the top of the charge. Sometimes, we think quick renders may not scale as well as the lengthier ones, but here we can see the 2990WX still set itself apart from the 2970WX. That said, the Intel competition isn’t lagging behind. With Corona, we’re seeing a result that mimics some others we’ve seen. Here, the 12-core fails to beat out the 7900X, but the 2970WX exhibits strong performance against the 7980XE. IPC clearly matters in Corona just as much as core count, so if you have a chip that excels with both, great performance will be seen. Take a look at that 7980XE performance, and imagine if it were boosted to 32 cores. 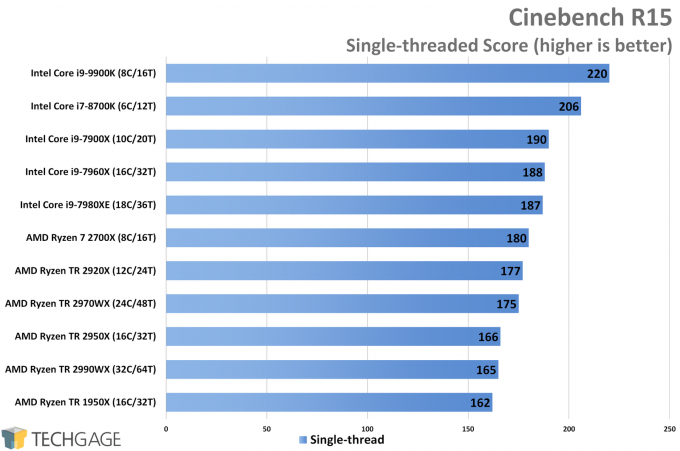 In Cinebench, the 24-core 2970WX managed to pull a good deal ahead of Intel’s 18-core 7980XE, but POV-Ray tightens the gap between the chips significantly. In both cases, the 2920WX was displaced by Intel’s 10-core. 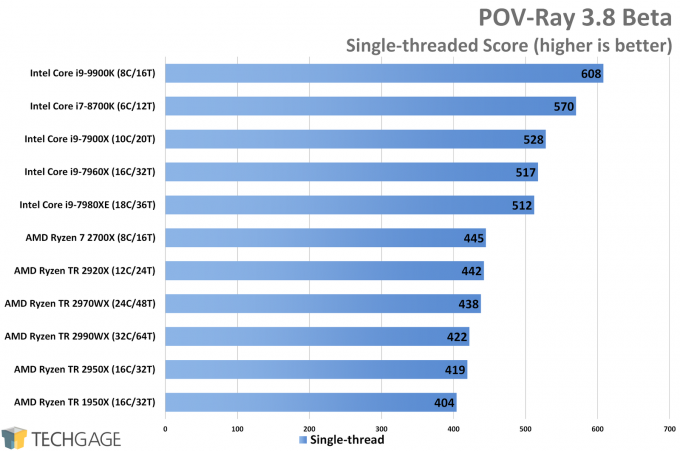 The single-thread results between CB and POV-Ray are also similar, with Intel reigning the top, and AMD underneath, propping those results up. We can’t wait for Zen 2.